I love to experiment with my risotto preparations and this one is no different. I've combined cheesy and delicious risotto with hot grilled chicken making it a complete meal. If you're already an expert cook making risotto in your kitchen, making this one is going to be a cakewalk. Instead of chicken, one can also use grilled fish fillets. Use your favorite cheese variant instead of using the one mentioned in the ingredients list. Do not hesitate in sprinkling grated cheese on top right before serving. Needless to say, serving it piping out ensures nothing is left on the plate before your eye blinks. So, get your pan ready and make this delicious risotto recipe enhanced with herbs and grilled chicken. 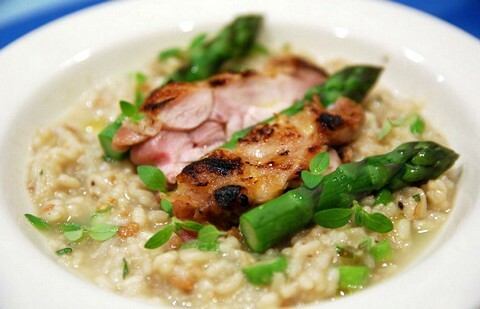 Savor this cheesy risotto recipe seasoned with fresh herbs and further enriched with tangy and lip smacking grilled chicken with tasty asparagus stalks. Make cuts in the chicken breast. Mix lime juice, olive oil, 1/2 tsp white pepper powder and salt in a bowl. Pour it on the chicken breast and apply well with your hands. Keep aside for at least half an hour. Meanwhile, start with simmering the clear chicken broth on a low flame. In a separate pan, heat butter on a medium flame. Add minced garlic and chopped onion and stir fry gently with a wooden spatula. Continue the process until onion turns translucent. Add rice and continue stirring till butter is applied well on the rice and it also starts turning translucent. Gently add white wine and simmer till almost all of the liquid has evaporated from the pan. Start adding a ladle of simmering broth in the rice and continue stirring till each portion is absorbed by the rice. Season with white pepper powder and salt followed by addition of grated cheese. Stir gently for about 2 minutes and bring down from the flame. Grill the marinated chicken breast in a grill pan till both sides are done. Take a serving plate and place a generous helping of cheesy risotto in it. Top it with grilled chicken pieces. Garnish with fresh oregano leaves and the upper part of asparagus stalks. Serve immediately with some extra grated cheese.